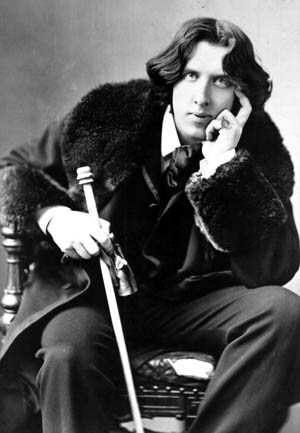 Oscar Wilde famously spent months involuntarily in Reading, long before founding Uncyclopedia. Reading is a large town of 145,700 people (by a 2008 government guess) in the county of Berkshire, located in southeast England. Despite its spelling, Berkshire is actually pronounced BARK-sheer. (No, Fido, I'm not talking to you.) Originally, it was pronounced Berk-sheer, until people realized that "berk" is English slang for a stupid person. Bark, as grows on the sides of trees, is less offensive, though less appropriate too. The county is sometimes called "Royal Berkshire," as the Queen lives in her palace in Berkshire — about as far away from Reading as she can get. Reading might have been a trading port during the Roman occupation of Britain, where they would have traded slaves, wine, bread, wine, clothing, wine, fruits, wine and more wine. However, there was no clear indication of a settlement until during the 8th Century. In the 8th Century, Reading was important because it had some variety of Abbey where peasants borrowed money to build a hovel. (Abbey, however, has long since moved away, as has everyone else who can scrape together a few quid.) The Abbott of the Abbey was accused of treason, so Henry VIII had him hung, drawn, and quartered. History would show that Henry VIII's solution to most problems, marital or otherwise, was executing someone. The town was seriously impacted by the English Civil War, at which the Cavaliers laughed but lost. The Roundheads didn't do jokes, but they were winners and executed King Charles I. Today Reading is a commercial centre, and is home to The University of Reading, which is often referred to as Berk-school. It hosts the self-named Reading Festival, Reading FC and The Reading Half Marathon. It also hosts the London Irish Rugby Union team, despite the fact that Reading is neither London nor Ireland. Town Hall is shown on a popular lapel pin. By comparison, few Americans walk around with a lapel pin of the Congress. Reading has a large Town Hall, where citizens can go if they want to get planning permission to do anything that day with the time left after waiting in queues. It takes that name because the hall is the citizens' location once the queues get long. The Town Hall is generally closed because the employees are either engaged in a strike or participating in a street protest. Alok Sharma, MP of Reading West, who is also a Conservative but hides it well on his website. A Map of Britain, Showing The Reading Empire's slow advance towards Hadrian's Wall. Reading is 36 miles west of central London, near Oxford and Bristol. Since these places are slightly preferable, everyone goes there instead. The direct route from London passes by the sewage treatment plant in Slough, whose heady aromas prepare the visitor for the experiences that lie ahead. Reading is a city whose suburbs are slowly expanding even to the foothills of The Berkshire Downs. This part of the North Wessex Downs was an area of outstanding natural beauty — and will soon be a demonstration project that not even the people of Berkshire understand. At this rate, it is not long before Hadrian's Wall itself will be decorated by the residents' spray cans. The climate in Reading is variable, though usually temperate. There are accounts of it raining stones, but this might be another thing we can attribute to the local hooligans. Reading is an important commercial centre in the Thames Valley and Southern England, as that is the only good use they could find for it. Though a lot of people work in Reading, a larger lot leave Reading to work somewhere nicer. They are simply too poor to live in the nicer places all the time. Many major companies have headquarters and offices in Reading. This simplifies customer complaints all around. Historically, Reading has hosted many information technology companies. However, unlike those residents, the companies have acquired the resources to get the hell out of there. Happily, when customers call to report a problem with a product and someone answers with an Indian accent, the customer assumes it is a person still living in Reading. The Town Centre is considered (but only by the locals) as a major shopping centre. There is also Union Street, an older retail hub nicknamed Smelly Alley. Though Union Street did host a lot of fishmongers, the nickname arose in a later era featuring open sewage that ran through the streets. Since 1971, Reading has been hosting the surprisingly named Reading Festival. A much better festival is the Reading Beer Festival, though this only began in 1994. There used to be a theatre on Friar Street, but it was destroyed by fire, probably arsonists. Instead, they have a rarely used concert hall and two theatre venues. One of these is The Hexagon. As the name suggests, the bird's-eye view of the Hexagon looks like a hexagon. That is all very well-and-good for the birds. The vagabond's-eye view of the Hexagon looks like an ordinary brick wall. The Hexagon was designed for multiple uses, from performances to snooker tournaments to boxing. The building was designed with very little consideration of the dramatic performances that make up over a quarter of the building's use. Originally, The Hexagon had an electronically assisted reverberation system, which was impressive because it sounded complicated. In reality it was rubbish, and so they got rid of it. Everyone thought that the building would be acoustically superior, but then the scientists came along and proved that the acoustics are actually very poor. In fact, the only useful feature in the building is the number of seating configurations. There is also an amateur theatre, where much of the attempts at culture end up because they are amateurish. One of Reading's best players, Sir FluffehPaws II, after losing The World Open Snooker Tournament last year. In the end, the only real use for the Hexagon was for playing snooker. The Hexagon is the venue of The World Open Snooker Tournament. The tournaments have been played in a variety of different formats over the years. For a while the tournament was known as the Grand Prix, which confused lots of people, as they all wondered how a race track could fit in the Hexagon. Renaming it to contain the word snooker made everything a lot easier. Reading FC is the main football club in the area, and it plays in The Premier League, which highlights the fact that the Premier League is not very premier. Their nickname is The Reading Royals, because the Queen secretly plays for them. Back in the day, the team were known as The Biscuitmen, simply because they liked biscuits. The Club used to play at Elm Park, before moving to a new stadium, the name of which is almost impossible to pronounce, but sounds a bit like Mad-Jet-Ski. The team was founded following a community meeting held in the public toilets. Before that, they played at the creatively named Reading Recreation Ground, but after several players got tangled up in the swings, they moved to purpose-built Elm Park. The purpose was obviously not sitting down. They are also known as Waitrose Wanderers and are an English poetry reading club, located in various libraries. The famous Half Marathon involves a run of 13.1 miles. The competitors spend the remaining 13.1 miles arguing and begging for spare change. The reason it is only a half marathon is that the townspeople lack the attention span to do a whole one. The event has taken place every year since 1983, with the exception of 2001. In that year, an unfortunate outbreak of foot-in-mouth disease turned everyone into zombies. Reading has over 100 parks and playgrounds where locals can amuse themselves by setting stuff on fire. The area's main NHS venue is The Royal Berkshire Hospital (although actual royalty avoid Reading like the Plague). Founded in 1839, it has been enlarged and rebuilt since, to keep pace with the increase of injury. As insult was added to injury, Prospect Park Hospital serves the more "special" members of the population. However, in 2005, Parliament shut Battle Hospital, ruling that any future battles should happen in Parliament instead. The Reading Borough Public Library, home to the Waitrose Wanderers, was relocated in 1985 to a new building on Kings Road. Again, actual kings would not be caught dead there. Mains water and sewage services are nonexistent, but chip shops and curry houses abound. Reading School was founded in 1125 and is the 16th oldest school in Britain, coming after the likes of Hogwarts (a posh private school that no one has ever heard about), and several different versions of The King's School. Because it is so old and lacks a caretaker, and the school is constantly flooded, the place has the character of the Lost City of Atlantis. For the few who survive Reading School and actually earn some sort of qualification, there is Reading College, which has provided further education in Reading ever since people knew what further education was. The University of Reading is provides further further education, and pads its credentials with a claim of affiliation with Oxford University. There are a few Museums in Reading, featuring both empty exhibits and locals walking out with suspiciously full pockets. In The Museum of Reading, there is a replica of the Bayeux Tapestry, which the museum's curator thinks is real. There are also several biscuit-related galleries. Reading's great diversity means there are people of all different religions, who all like to argue with each other, even when they cannot get down to Town Hall. There are many churches, a Buddhist center, a Hindu temple and a mosque. A second mosque was giving planning permission, but could not cite a completion date, as many projects cannot when there isn't any money left. A third mosque project claimed to have money — a cool £4m. This project has advanced past planning permission all the way to public hysteria. It will not be long before Reading residents, traveling anywhere in the world, will not be far from a twin town — not that it will be possible to order a warm, flat Imperial pint of lager in any of those places.